Rotary's International Assembly, its annual training meeting, gives incoming District Governors the chance to share ideas for strengthening clubs and improving communities with Rotary leaders from around the world. That Assembly takes place each year in San Diego, with attendees from the 529 Districts around the world, which contain 32,000 clubs. On January 17, Lynchburg Morning Rotary Club President LaShonda Delivuk delivered a motivational talk to those global attendees. 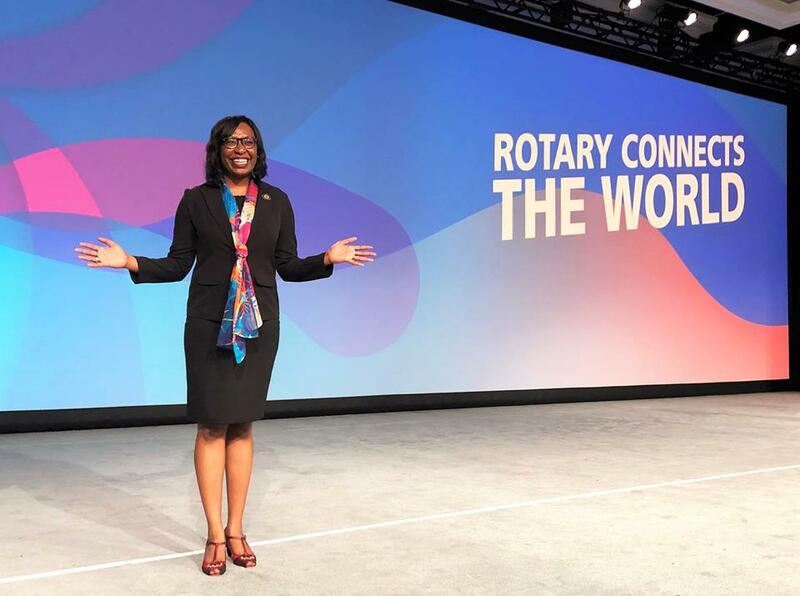 District 7570, with 82 clubs, has only had one person to ever address the Rotary International Assembly before. That was W.E. "Bill" Skelton, who was President of the Christiansburg/Blacksburg Rotary Club, District 7570 Governor and Rotary International President - the only one ever from our district - in 1983-84. When Skelton addressed the Rotary International Assembly 35 years ago, women were not even allowed to become members of Rotary clubs. Kudos to LaShonda for her zeal and drive to "Be The Inspiration" to other Rotarians, and for putting Lynchburg Morning Rotary Club and Rotary District 7570 on the map of Rotary International!